Offering panoramic views of the Aegean Sea, the caldera and the volcano, the Aqua Luxury Suites Santorini offers elegant accommodation, some with an outdoor hot tub or a plunge pool. 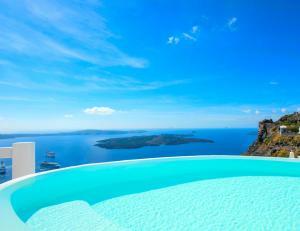 Please inform Aqua Luxury Suites Santorini in advance of your expected arrival time. For this, you can use the special requests section when making the reservation or contact the accommodation directly. The contact details appear on the booking confirmation. All children are welcome at the hotel and babies and children up to 6 can stay for free. Suite with an outdoor hot tub and a private furnished balcony with direct views of the Aegean Sea, the Caldera and the volcano. It has air conditioning and a seating area with a sofa and a flat-screen satellite TV. WiFi connection is free. All suites include full breakfast daily. It is not suitable for small children or people with reduced mobility, since there is a staircase. Honeymoon suite with private shaded balcony, outdoor hot tub, 2 sun loungers, air conditioning, uninterrupted views of the Caldera, the Aegean Sea and the volcano, seating area with sofa and flat-screen satellite TV Free Wi-Fi access is available. A full breakfast is served daily in the suite. Children can not be accommodated in rooms of this type. This room features air conditioning and a private hot tub with caldera views. It opens onto a shared furnished terrace of 30 m². WiFi connection is free. This elegant Santorini accommodation features air conditioning, spacious bathroom with shower, 1 king size bed, luxury toiletries, minibar, free WiFi, safe and access to a small patio with partial views from the living area. This room has sea views, air conditioning, a flat-screen TV and bathrobes and slippers. Free WiFi connection is provided. This suite has a seating area, a minibar, bathrobes, slippers, toiletries and a balcony or terrace with sea views. This villa has a sofa, a flat-screen TV, a private entrance and a private outdoor hot tub. This villa has a seating area, a sofa, a dining area and a private outdoor hot tub. This junior suite features a private balcony with views of the Caldera and the volcano, a king-size bed, a bathroom with bathrobes and free toiletries, and a flat-screen satellite TV. This suite has a minibar, spa bath and bathrobe. Suite with bathrobe, air conditioning and minibar. This suite features air conditioning, satellite TV and a minibar. This suite has air conditioning, minibar and bathrobe. This double room has air conditioning, bathrobe and satellite TV. This semi-detached suite offers views of the Caldera, the Aegean Sea and the volcano, and consists of 2 separate bedrooms with king-size beds and 2 bathrooms. There is free WiFi. Featuring a 80 m² terrace with an outdoor pool and panoramic views of the caldera, the Aegean Sea and the volcano, this suite consists of a bedroom and a living room. It includes air conditioning, a minibar and a flat-screen TV with satellite channels. There is free WiFi.